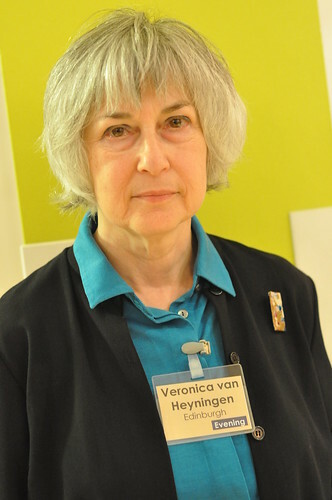 Aniridia Network UK’s Patron, Veronica Van Heyningen, was the subject of the BBC Radio 4 programme Life Scientific today. The half hour interview explored her love of research, particularly on the aniridia and the PAX6 gene plus her contribution to the ethics of working in genetics. Since retiring Veronica has become Honorary Professor and Visiting Scientist at the Institute of Ophthalmology, University College London which is attached to Moorfields Eye Hospital. She is a good friend and colleague of many of the doctors that ANUK members are seen by. We announced Veronica’s appoint as Patron at our 2013 Conference. Since then she has been outstanding at recruiting several of the most experienced doctors and researchers in aniridia, in the UK to join her on our Medical Panel. Hence ANUK members can ask these experts questions via our enquiries service and at our conferences. She has also contributed to discussions on how ANUK should develop. Thousands of listeners will have heard details of aniridia for the first time from this programme. So thank you Veronica for sharing your scientific life with the world and with Aniridia Network UK. This entry was posted in ANUK news, Medical staff talking, Research and tagged media, Patron, Veronica. Bookmark the permalink.